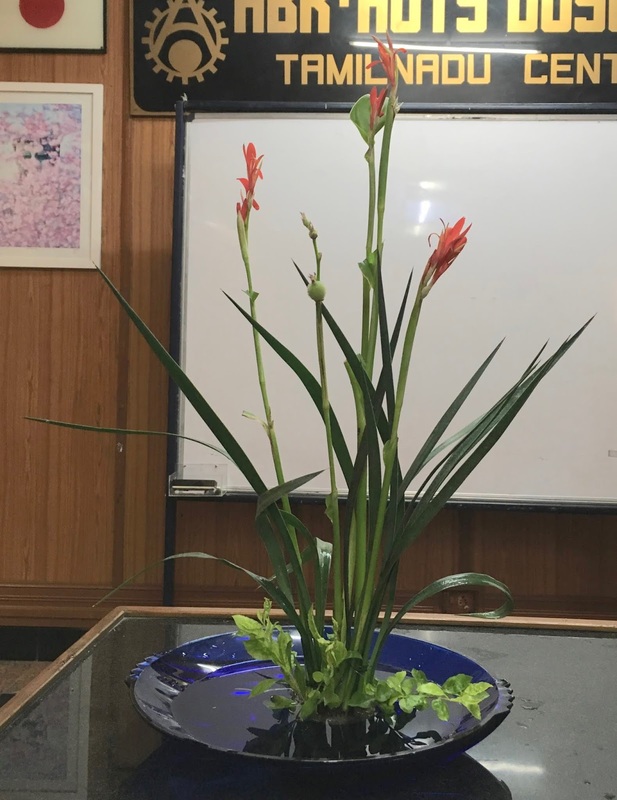 Fifteen members gathered for our August monthly meeting. 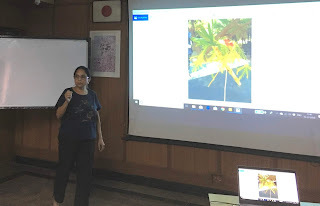 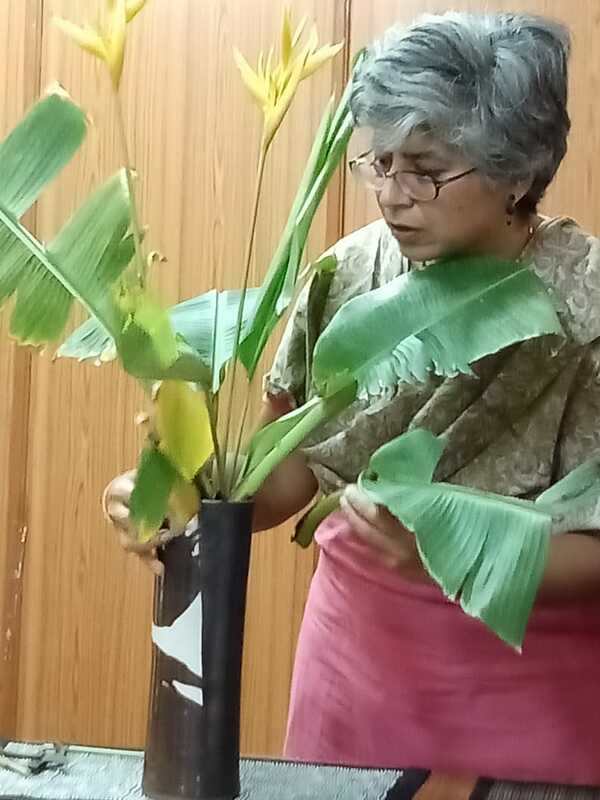 The agenda this time was a demonstration by sensei Meenakshi Sarin on the theme go Hope in Adversity, and a workshop to follow in the same theme. The Study Group was delighted to welcome back Meenu after her convalescence and absence from the meetings, and it was an apt title for her personal experiences of the last year. She was assisted by her student Shylaja, and her heartfelt narration that accompanied her compositions inspired all of us who were present. Sensei Meenu's first composition was this freestyle Nagiere. The adversity was represented by the black vase which seemed to envelop her life. However, through every nook and cranny, there was an outpouring of hope, symbolised by the white branches moving strongly upwards. 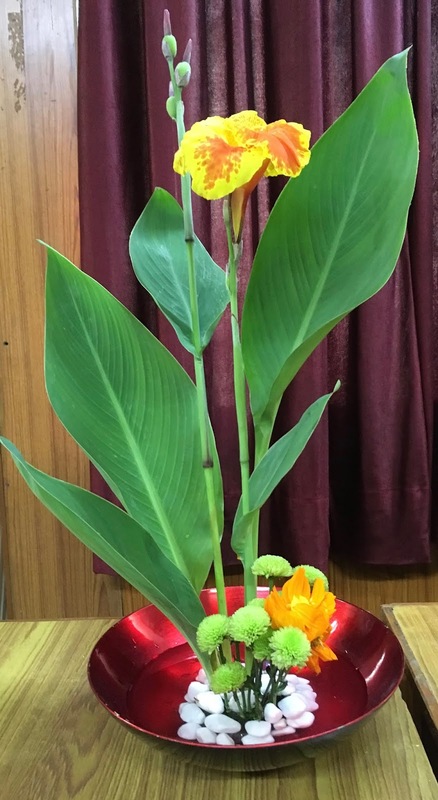 The contribution of friends, family, doctors and Ikebana were represented by the flowers, each unique and different and special. 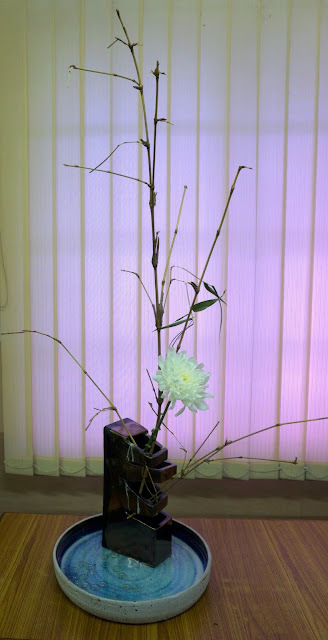 The Asia Lily is like the lights on the operation table that are imprinted in her mind. 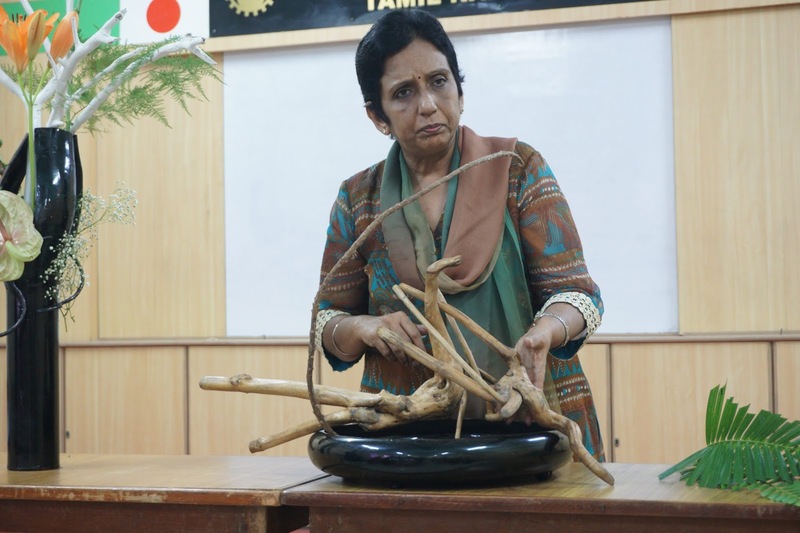 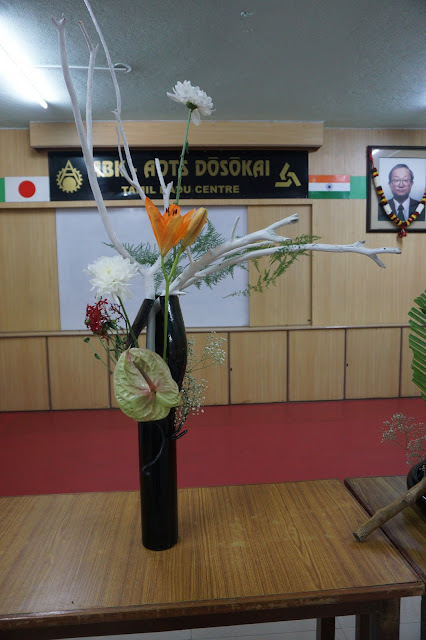 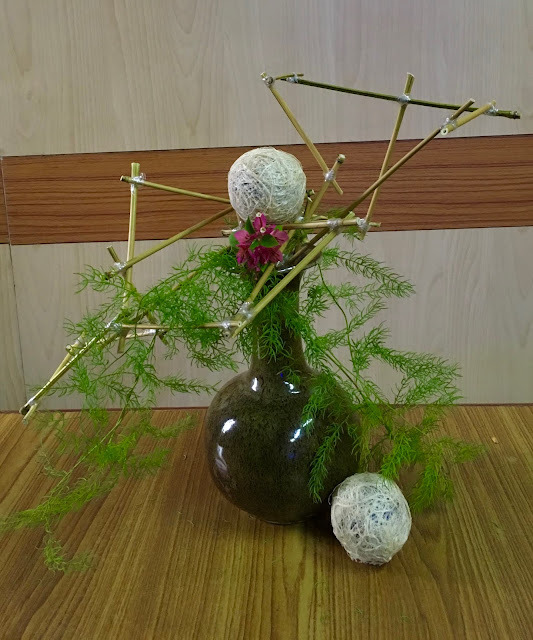 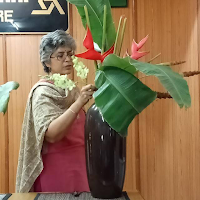 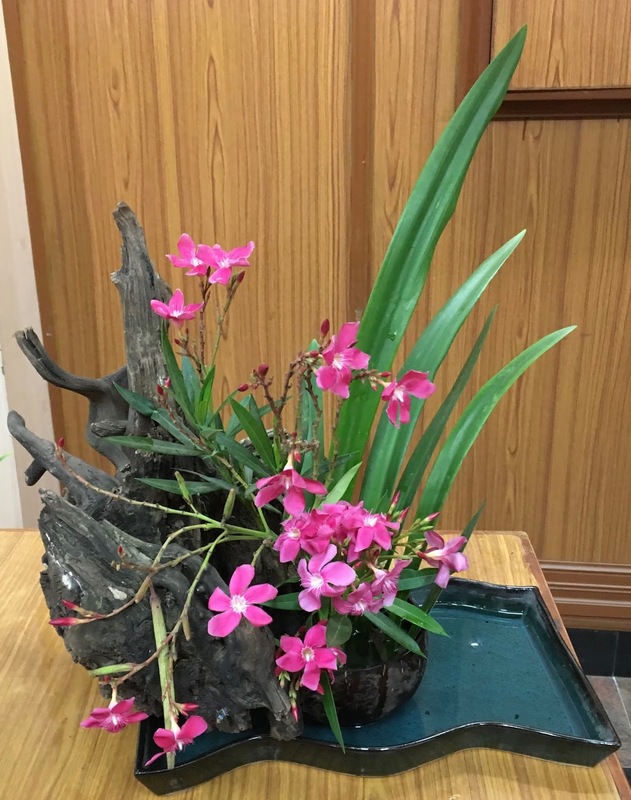 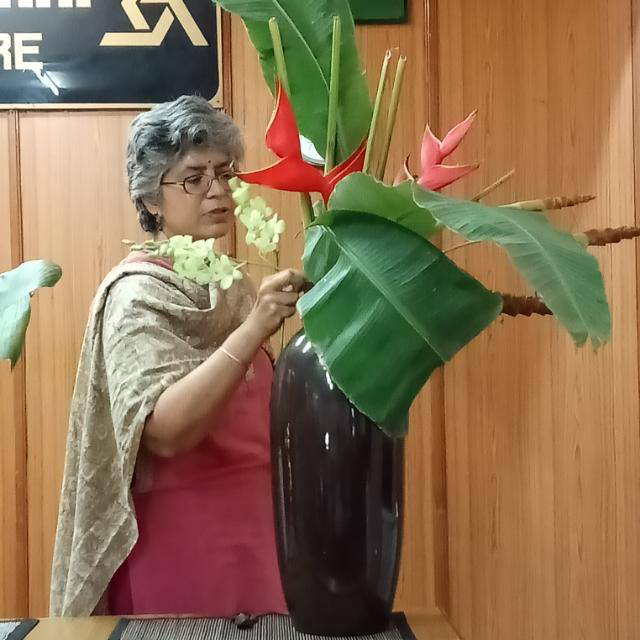 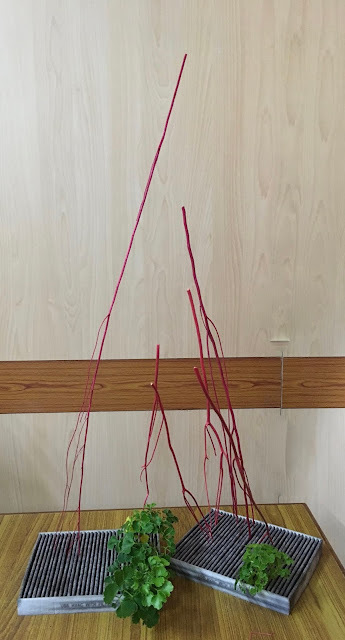 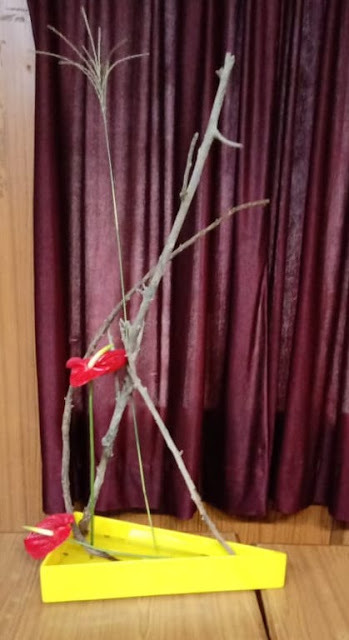 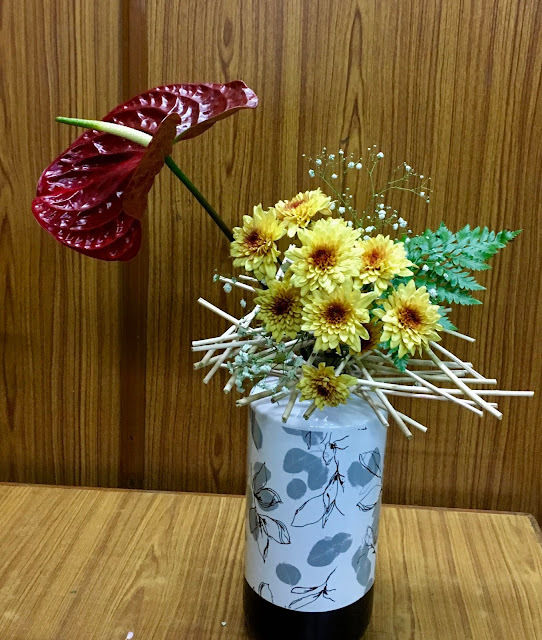 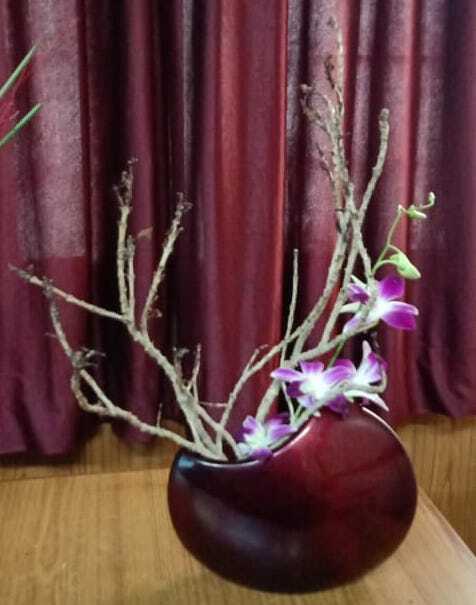 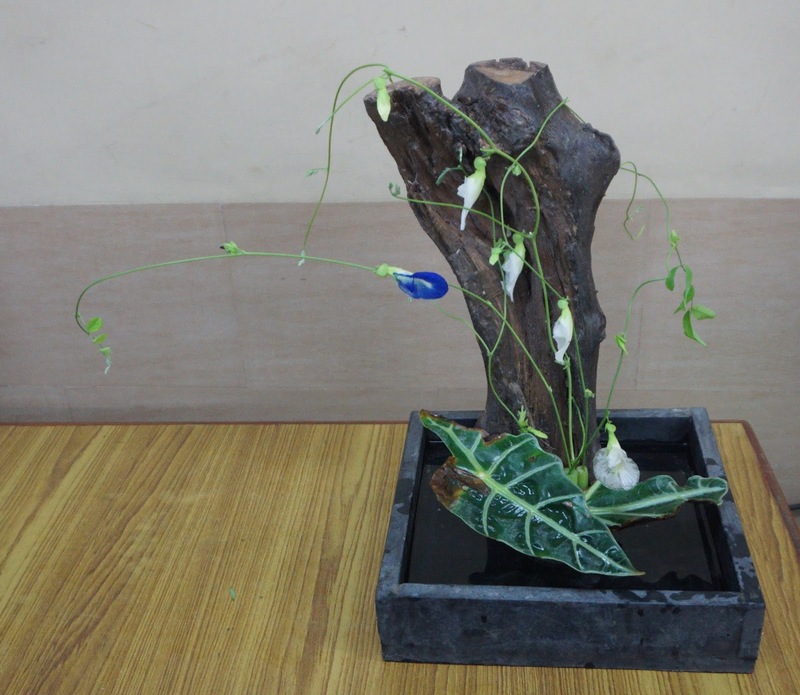 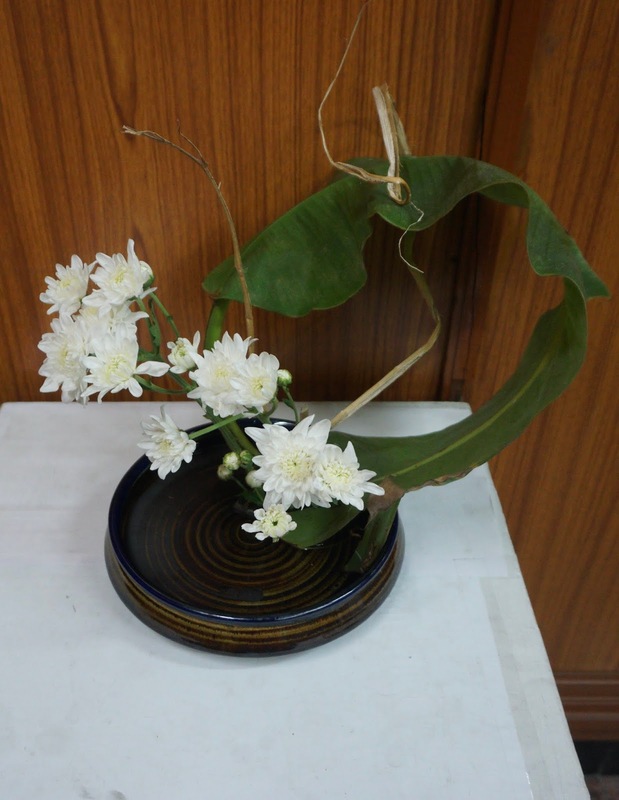 She started on her second composition which was a moribana arrangement, with the placement of a large driftwood, which for sensei Meenu, symbolised the state of mind and body, twisted and moving in all directions. 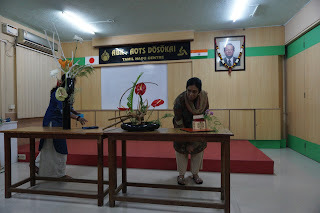 Sensei Meenakshi interprets the box of Pandora, with Hope still within, as sufferings and misery are inflicted on us. 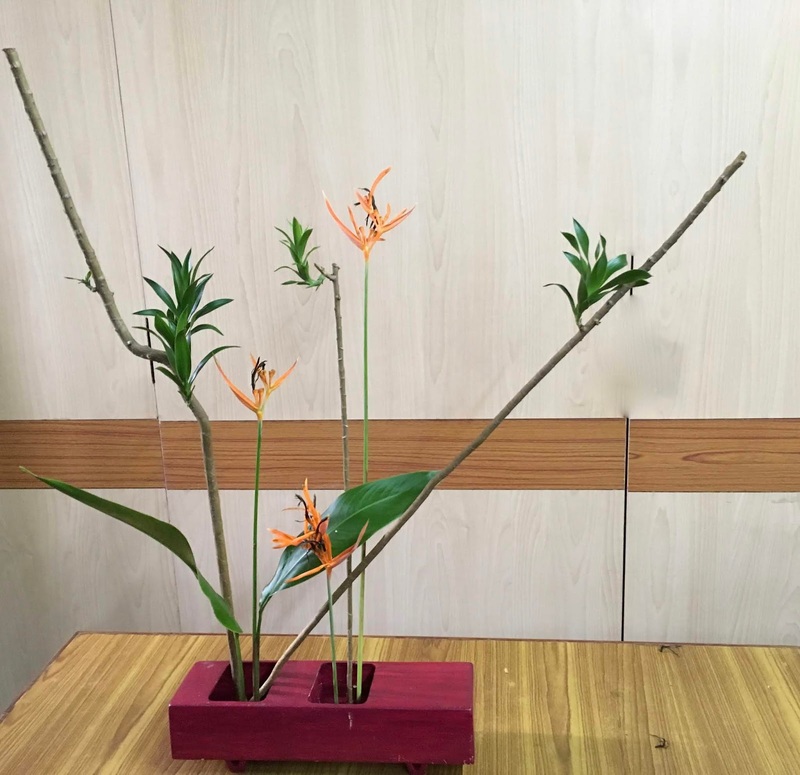 With her three arrangements, each different in character and narrative. 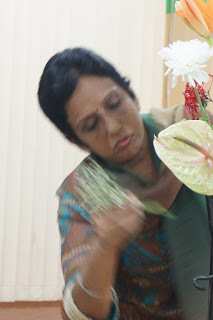 It was then time for the workshop. 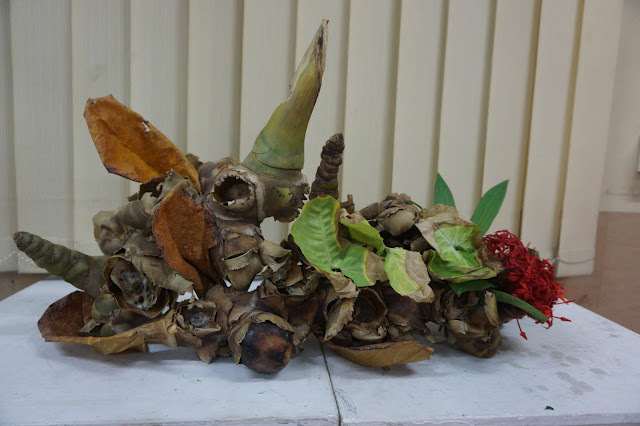 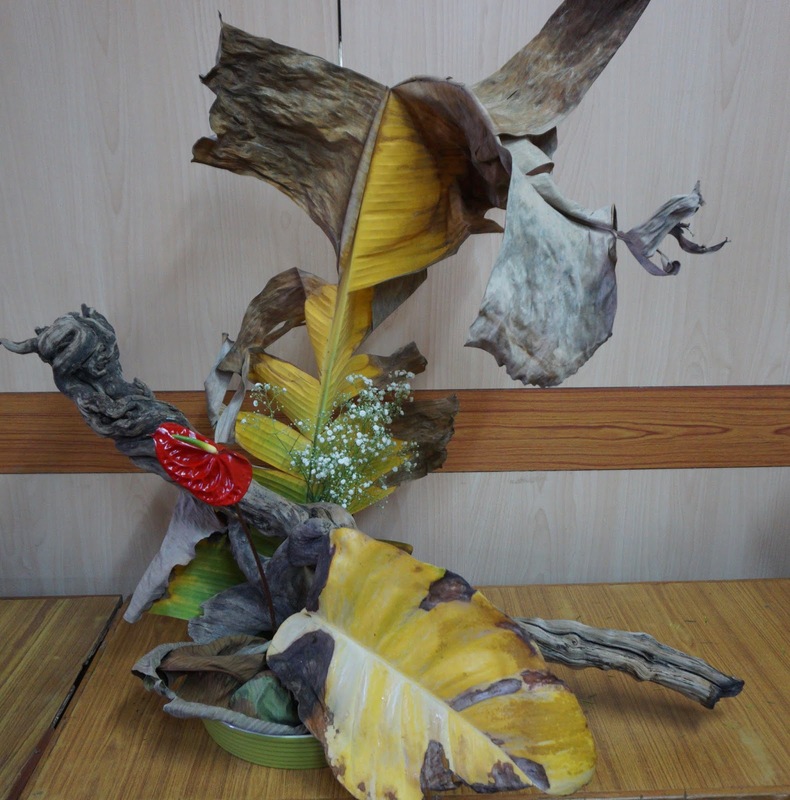 Chitra Rajan's composition with the blue flowers showing the fragility of hope as it clings on, despite adversity, symbolised by the driftwood and the leaf that is in decay. 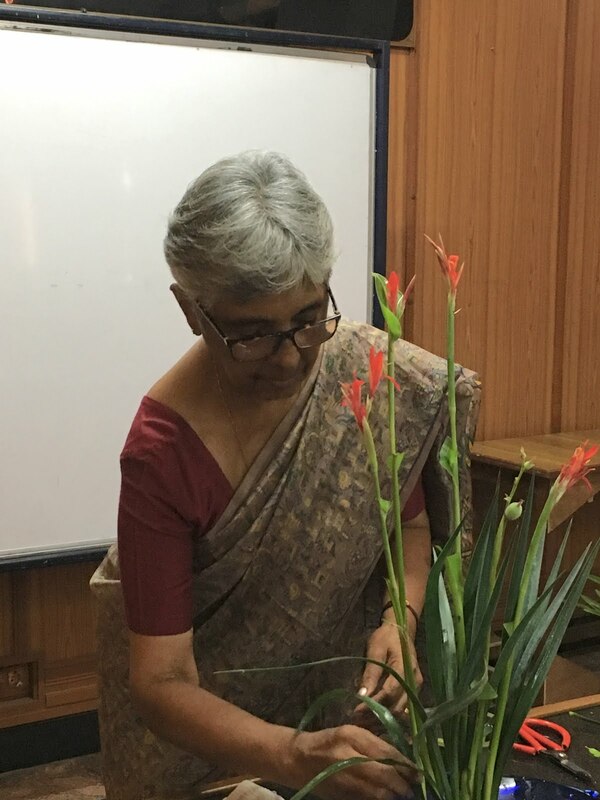 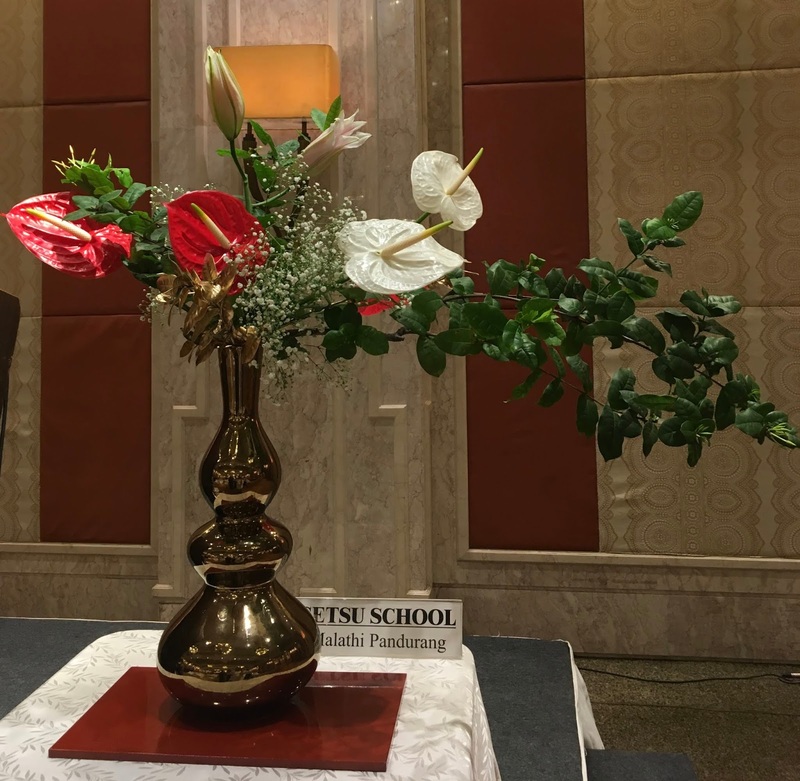 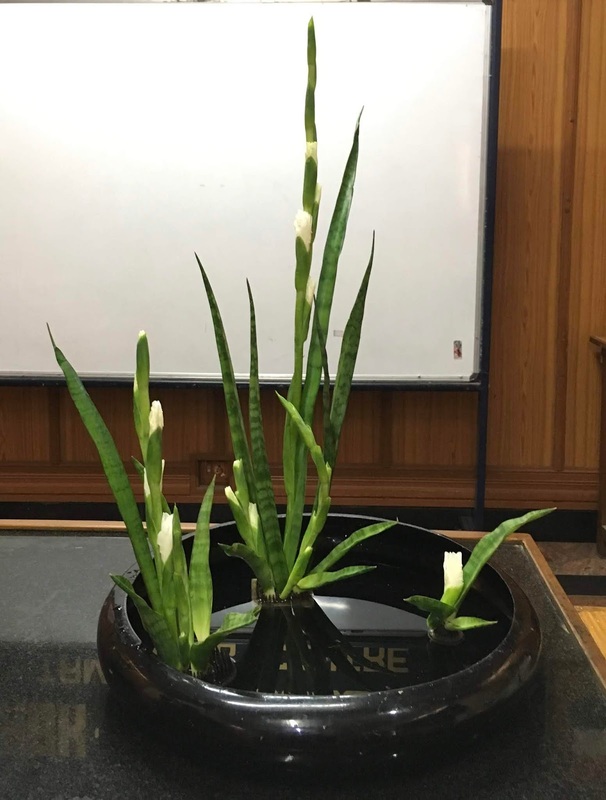 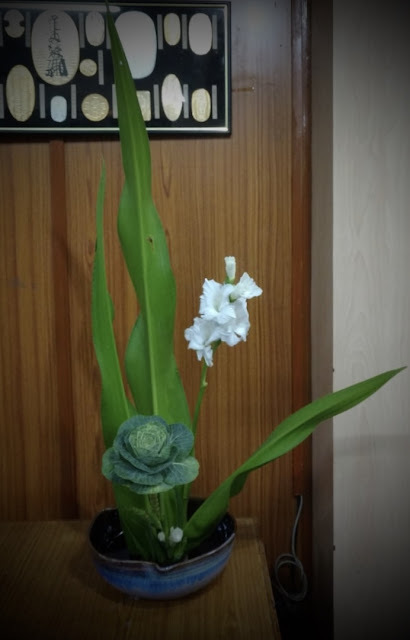 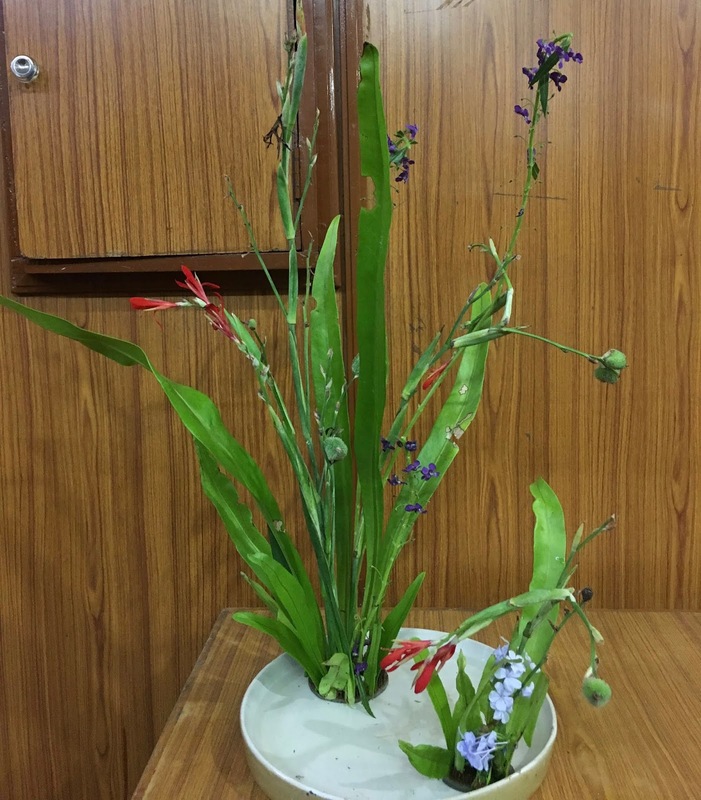 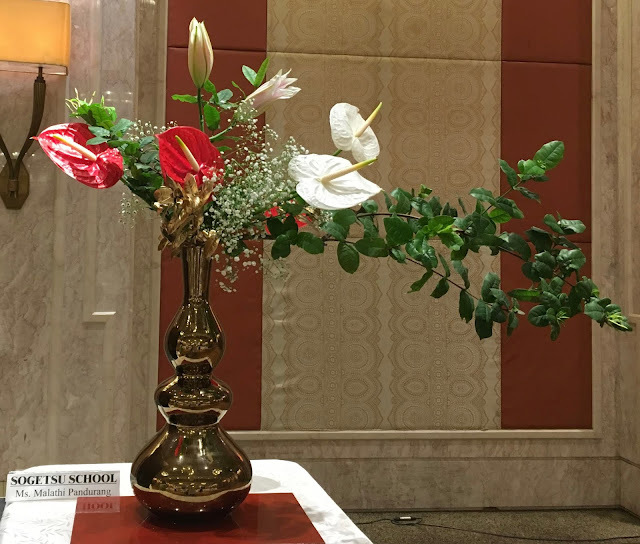 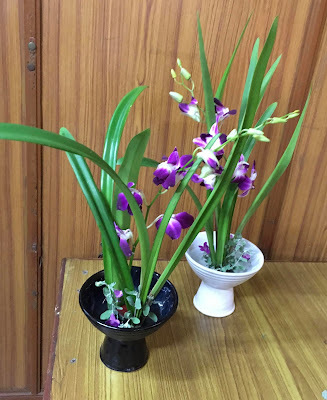 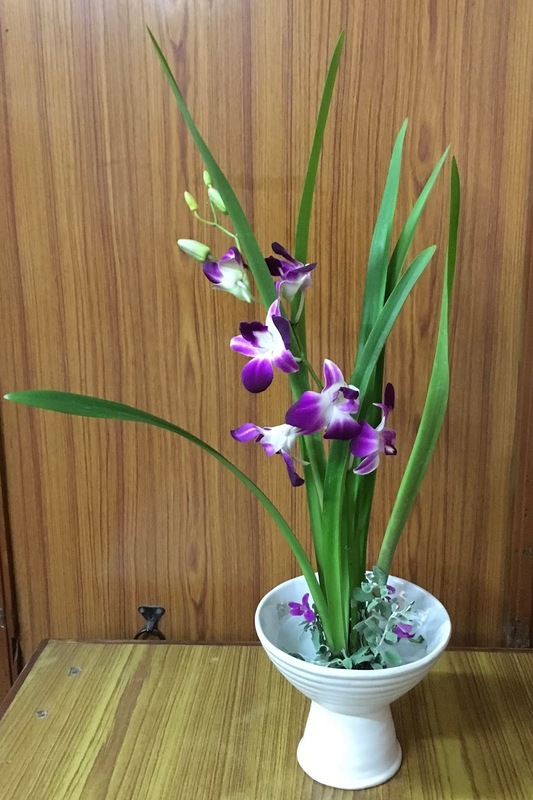 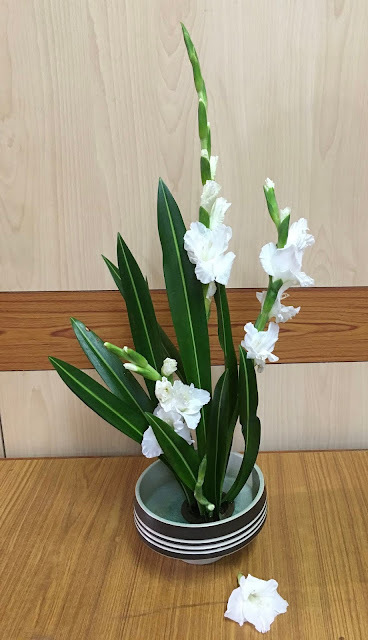 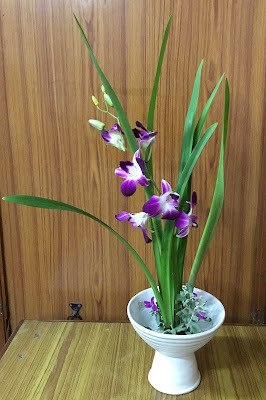 Sensei Malathi wished to convey that the glass vase is the hope she clings on to as it seems that life is ebbing out of her favourite plant in her garden. 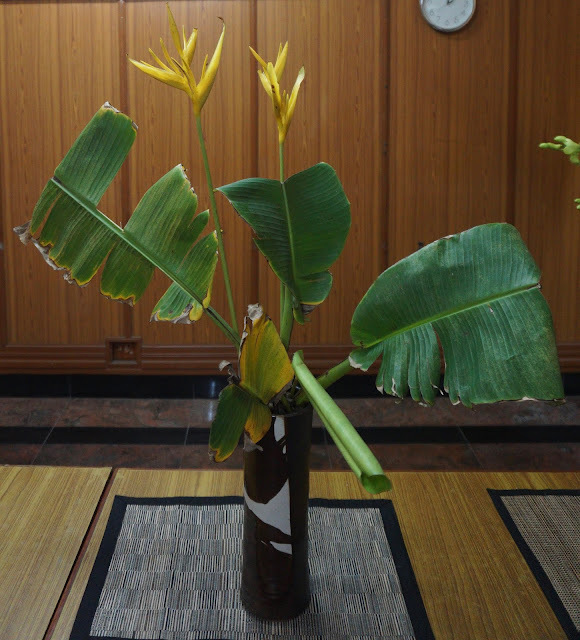 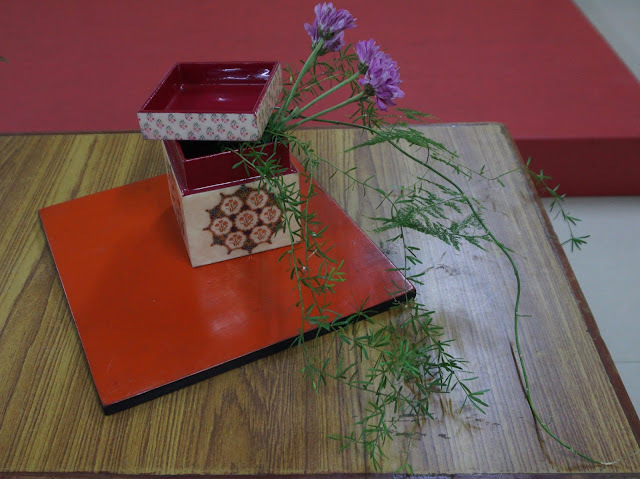 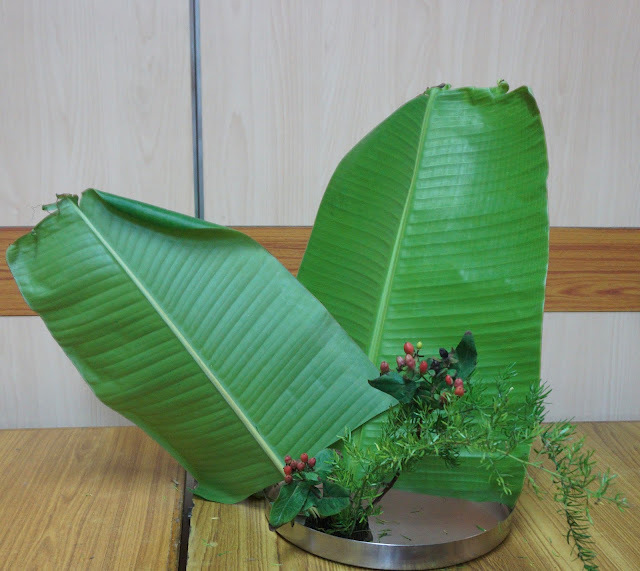 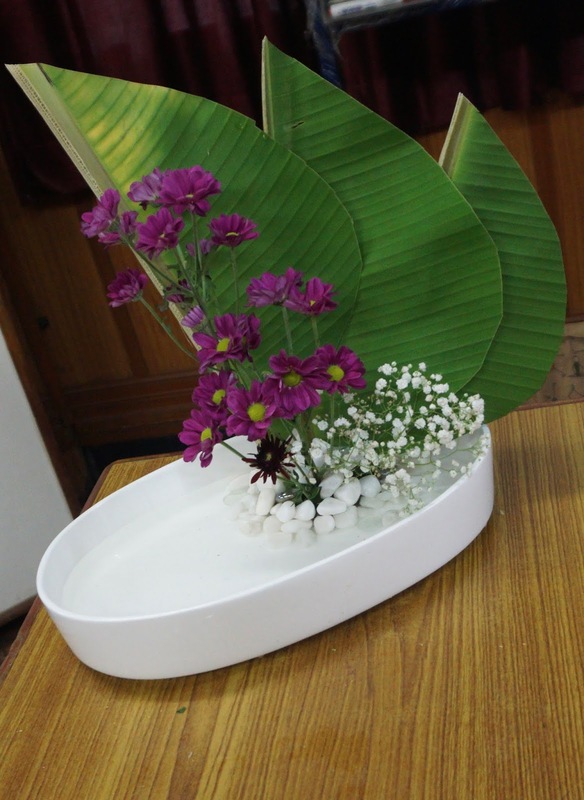 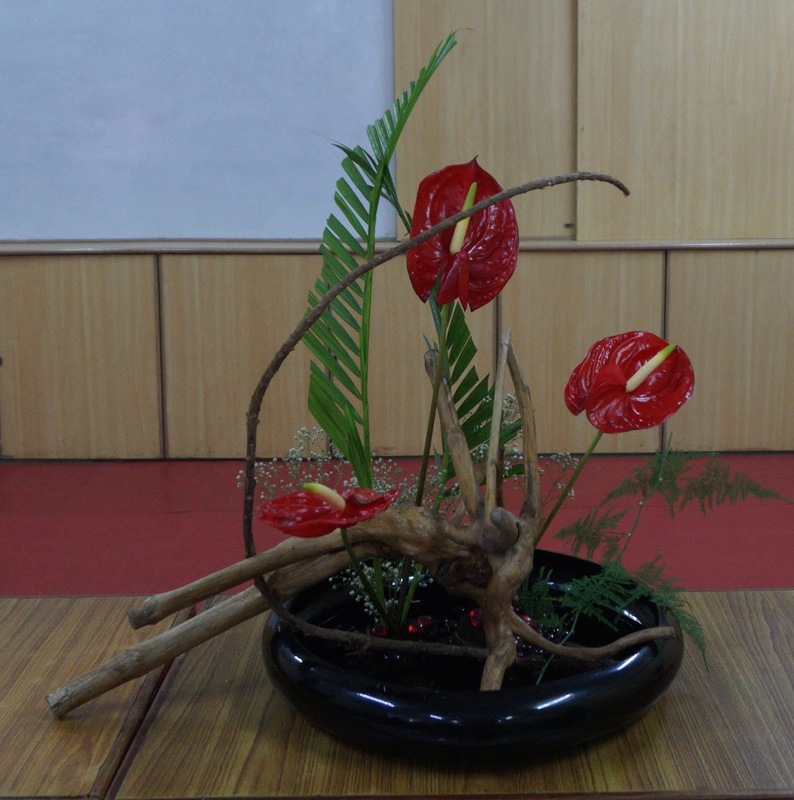 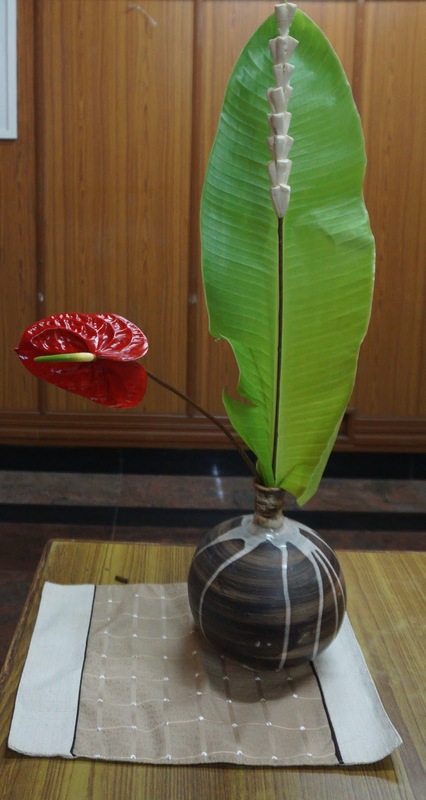 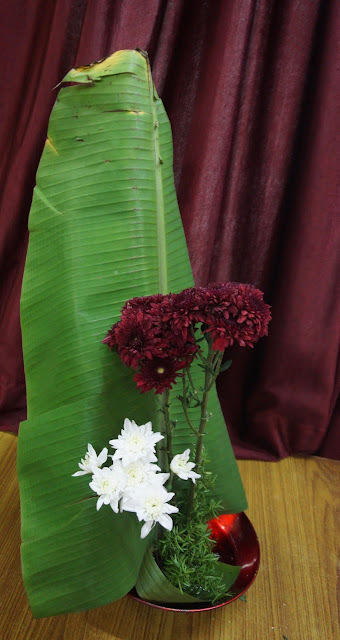 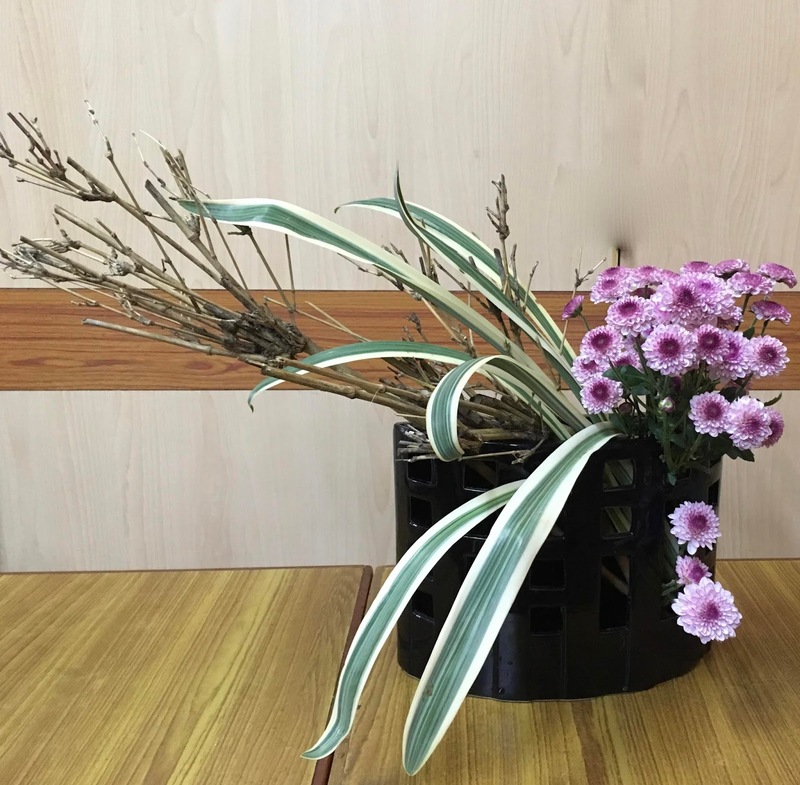 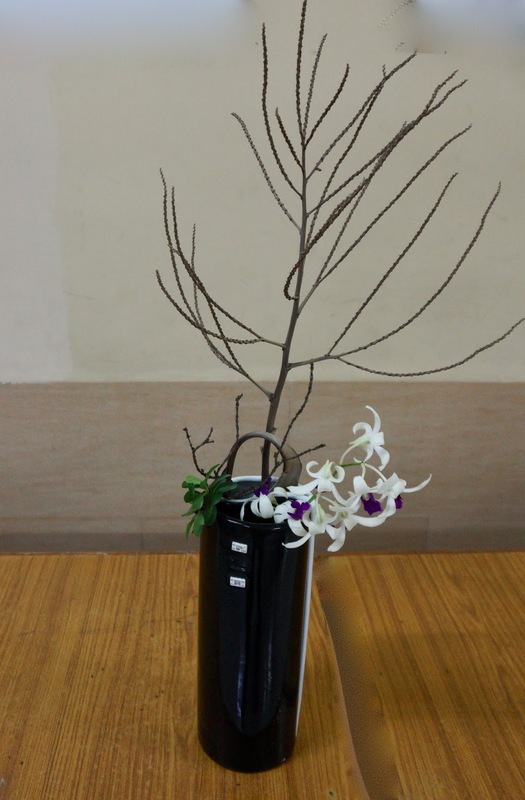 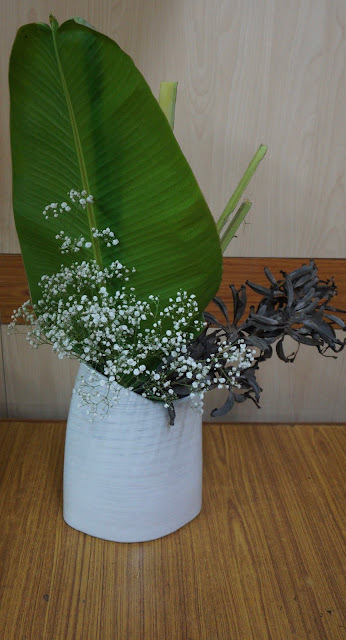 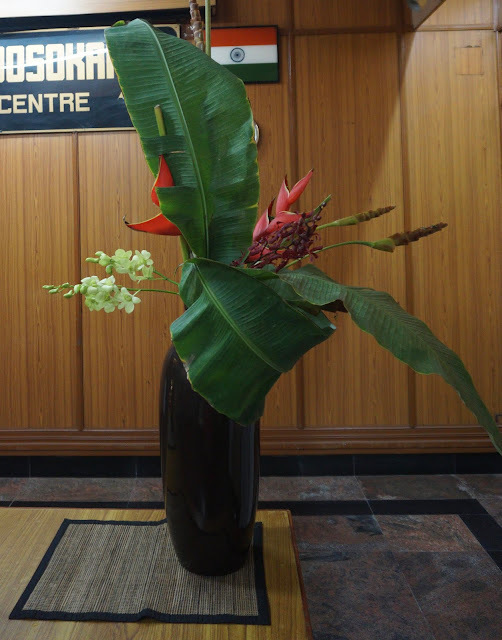 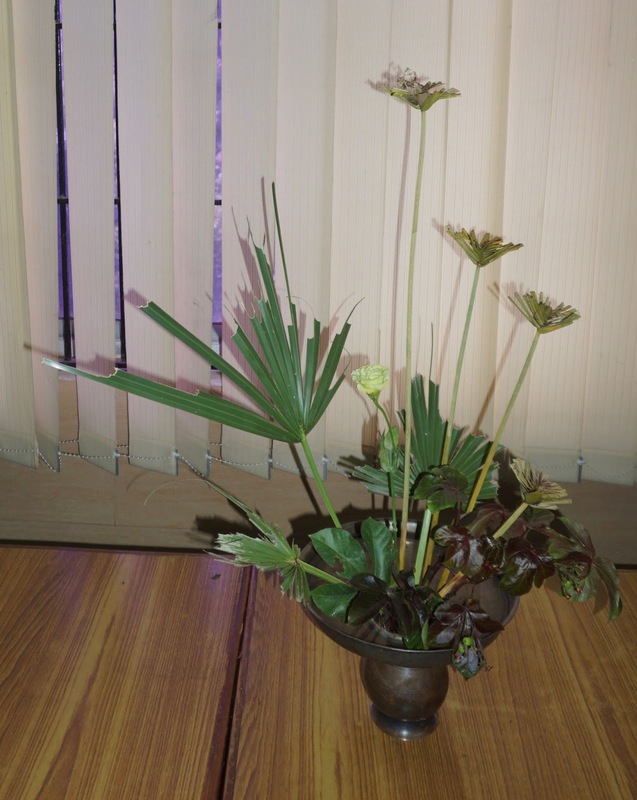 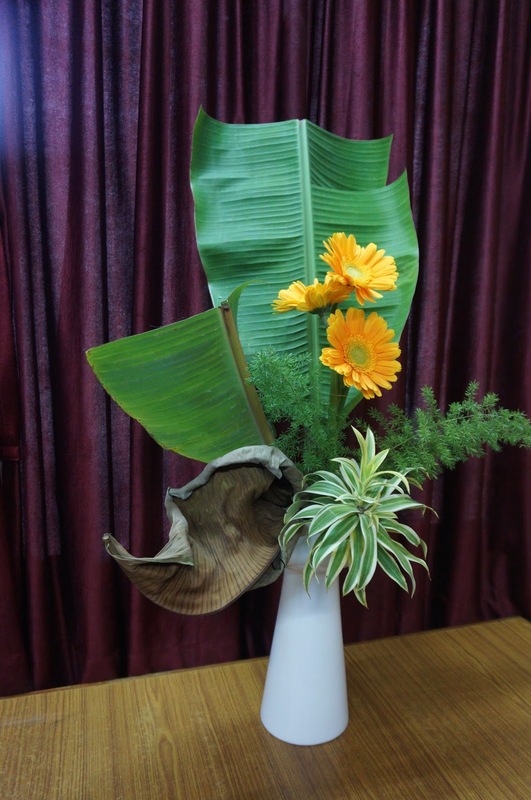 Chitra Thiagarajan used the dried stalk of nungu (Palmyra palm) to represent adversity in her table arrangement without a vase. The bright red head of ixora emerging as hope. 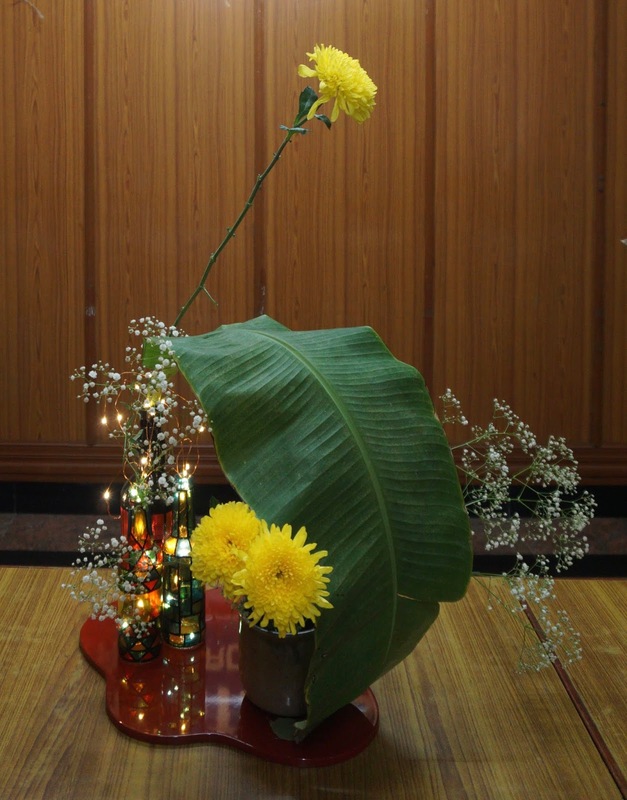 For Jyotsna, the jerberas stood out as rays of sunshine/hope despite the adversity in which it is grounded. For Sensei Padma, sensei Meenu's narrations were close to home. 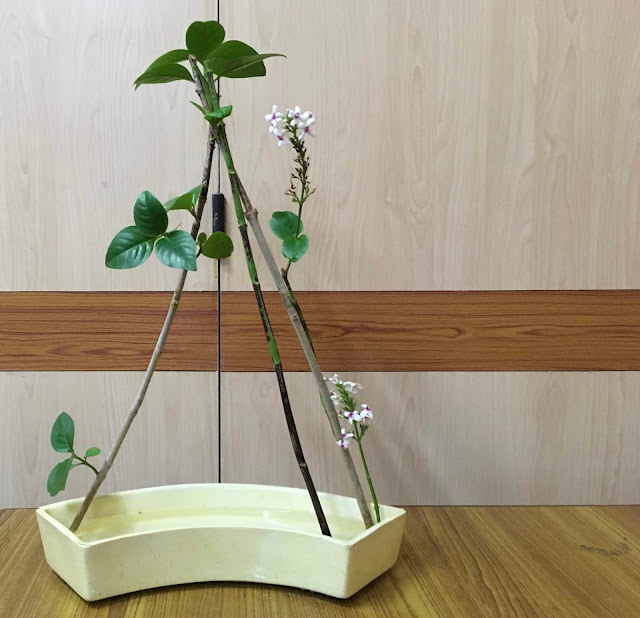 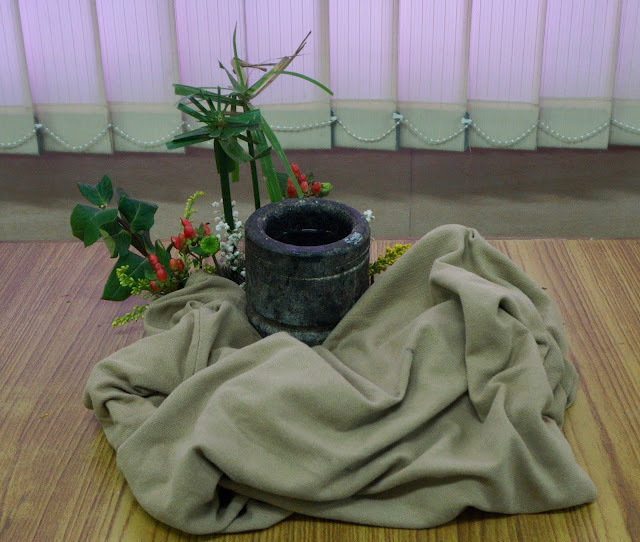 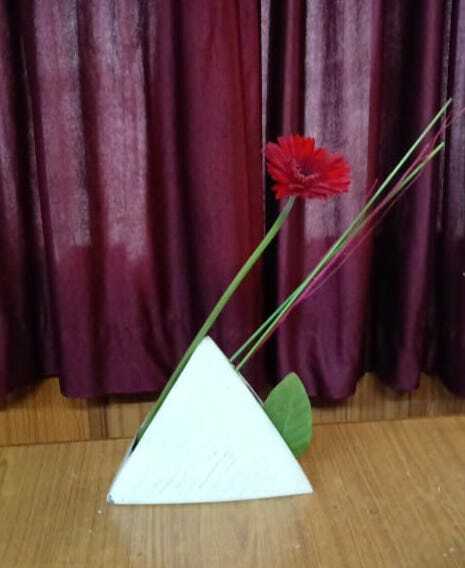 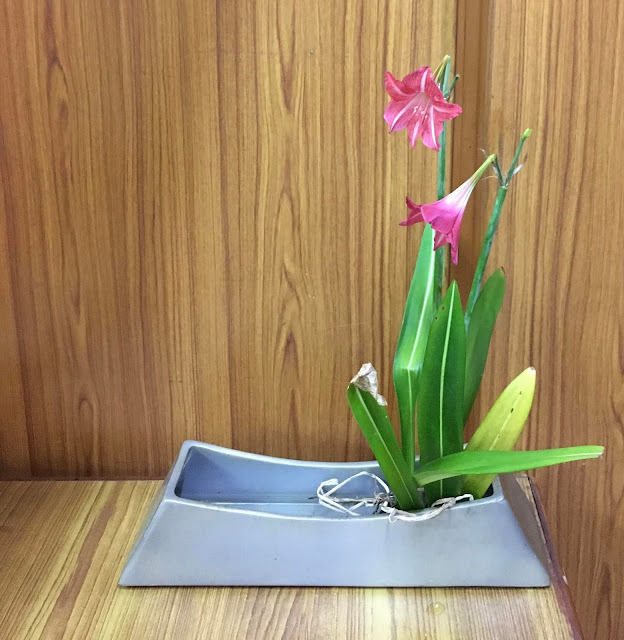 She used the vase with a narrow mouth to represent how adversity surrounds our hearts, bodies and mind, and seems to take us down, until the flowers of hope emerge out, and we begin to believe and be optimistic once again. 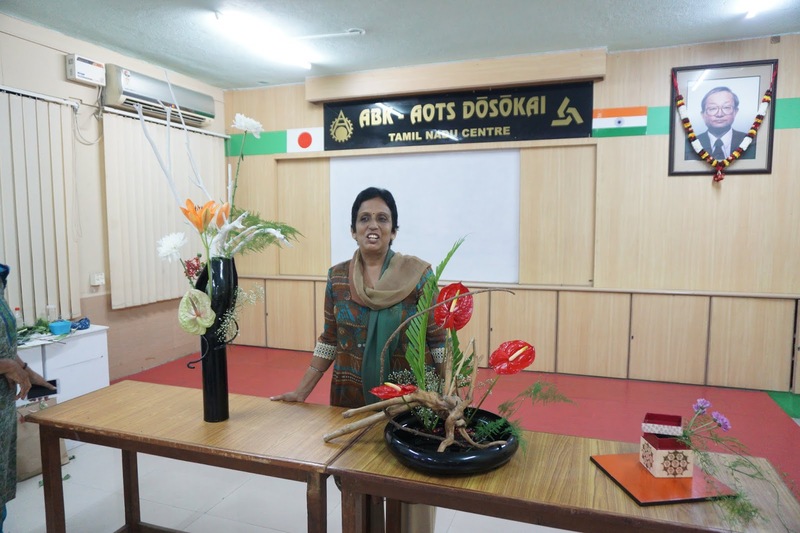 Sensei Ambika worked with the adversities that face Nature itself. 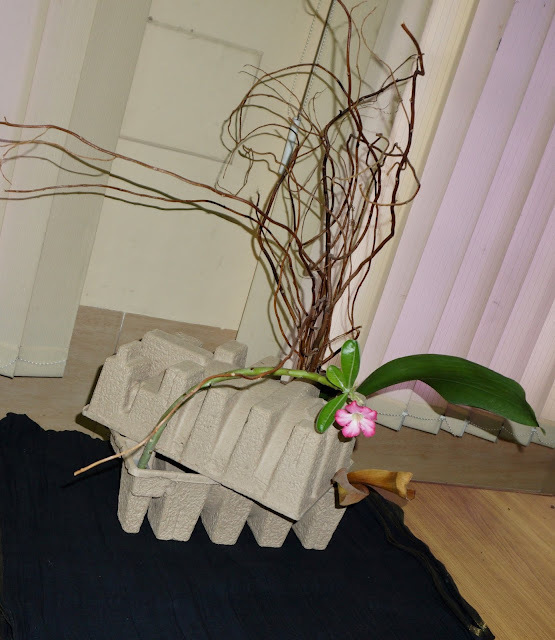 The carton boxes symbolise the garbage we are generating, as also the willow lines - like metal and concrete everywhere. In this bleak scenario, Hope blooms as a single aedinium flower. 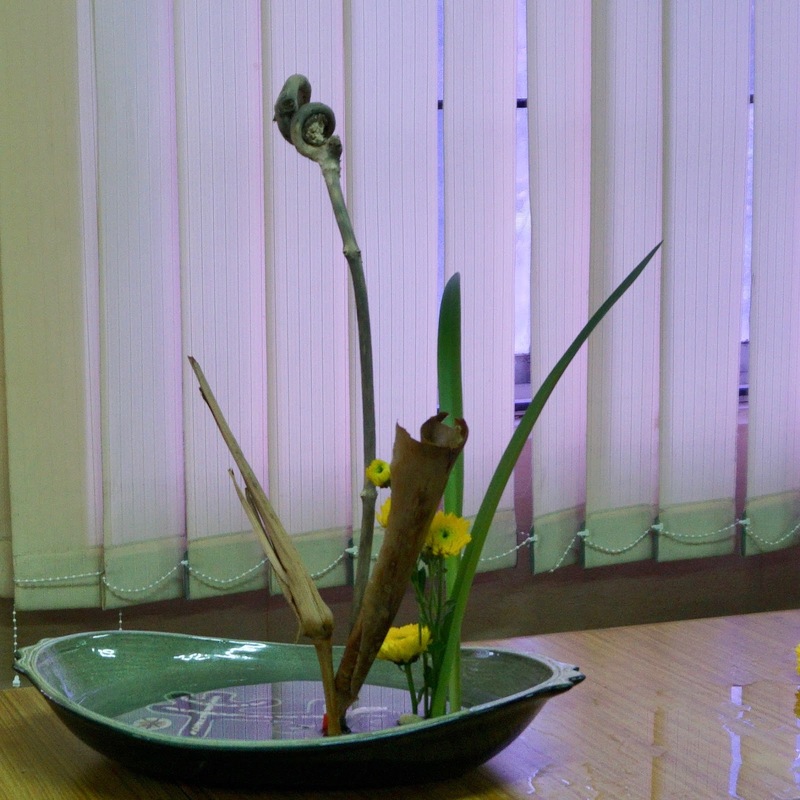 Sensei Molly relived the adversity of the floods that wrecked her home and garden. 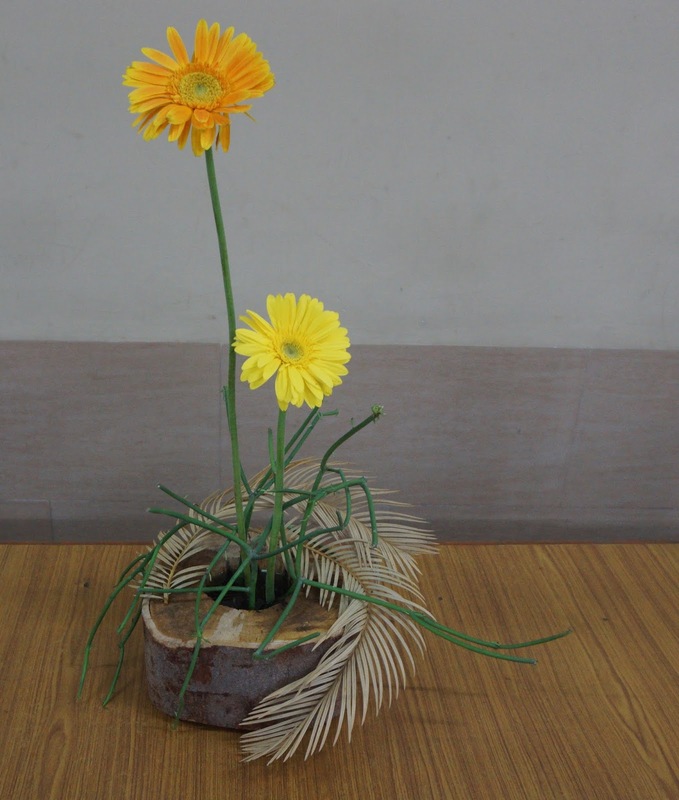 As life struggled to return to normal, Hope in the form of the single flower gave her courage to move on and rebuild. 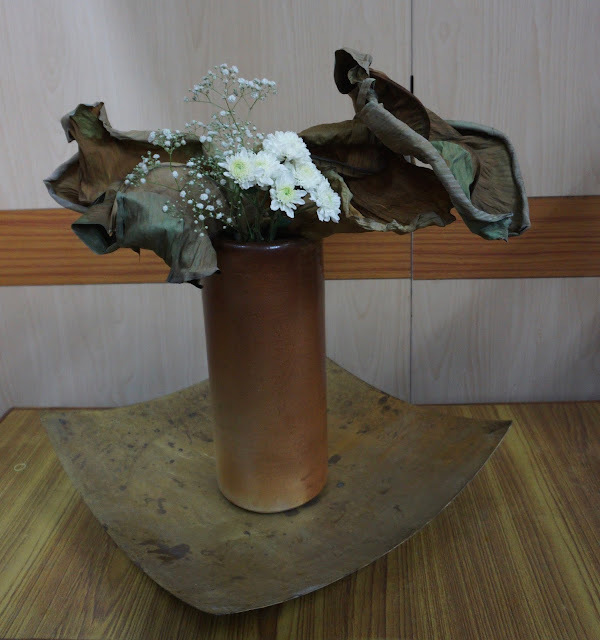 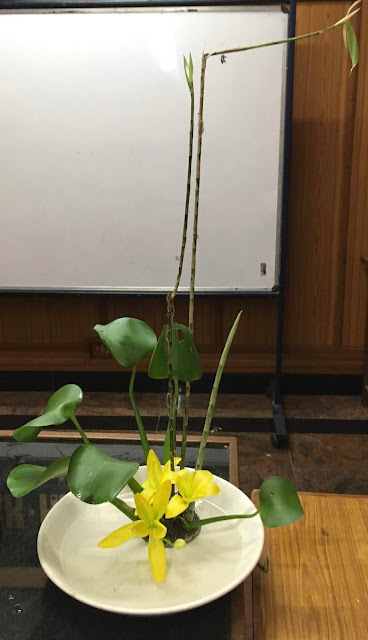 Natural adversity affecting us was also the theme of sensei Prerana's composition that narrated the situation of the floods in Kerala, with the blue inner surface of the moribana vase representing the rising flood encircling human life, and causing damage, as can be seen y the crack in the inner brown vase. 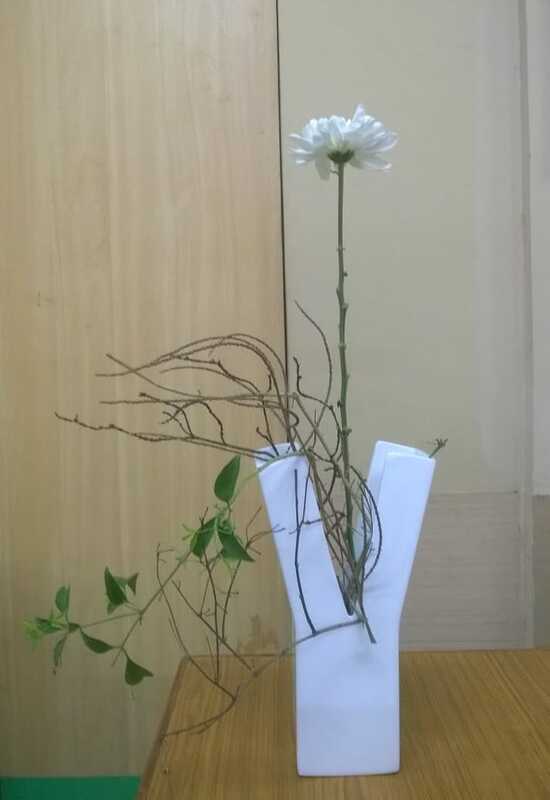 Hope and rescue came from the air, and the large white chrysanthemum is giving hope and succour to all those in adversity. 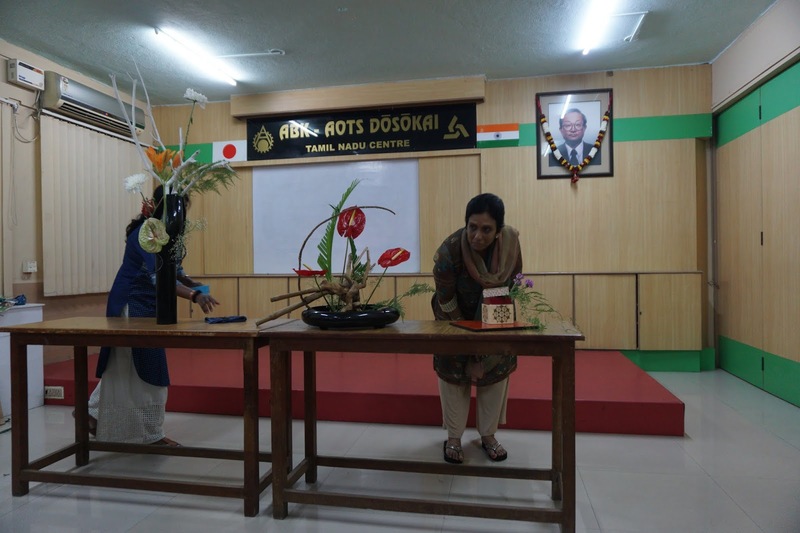 Sensei Janaki experimented with creating the adversity of the desert where hope is in the form of an oasis. 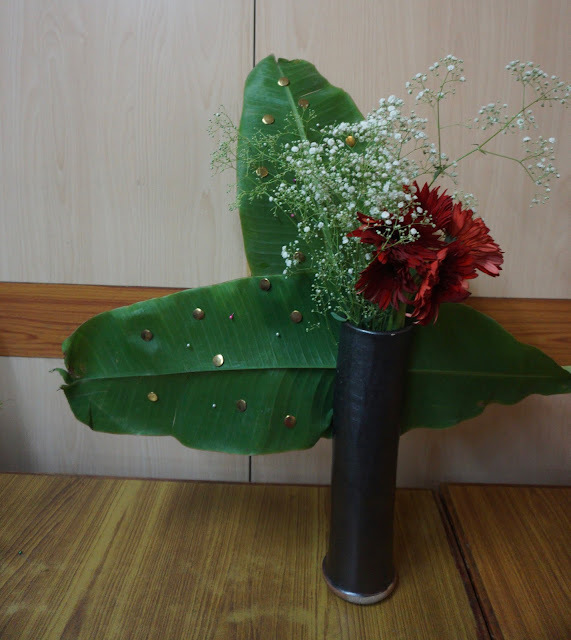 Bhuvana used a single spray of white flowers to symbolise Hope. 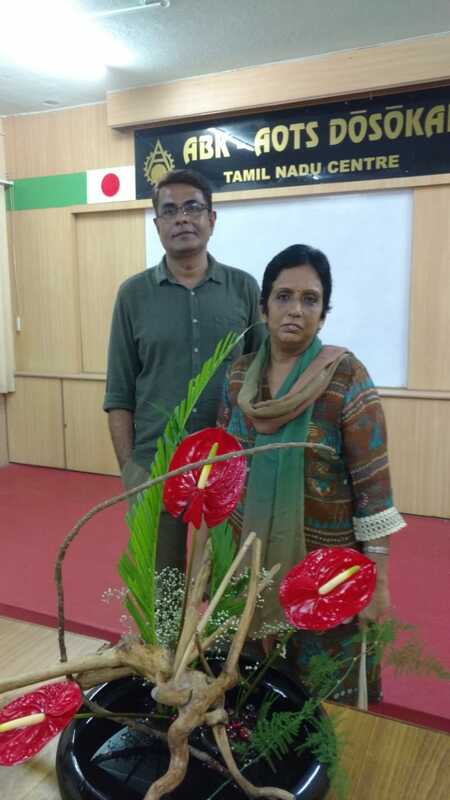 Sensei Trishala also interpreted hope in the adversity of the Kerala floods. For Shylaja, hope rises strong and vibrant winning over adversity. 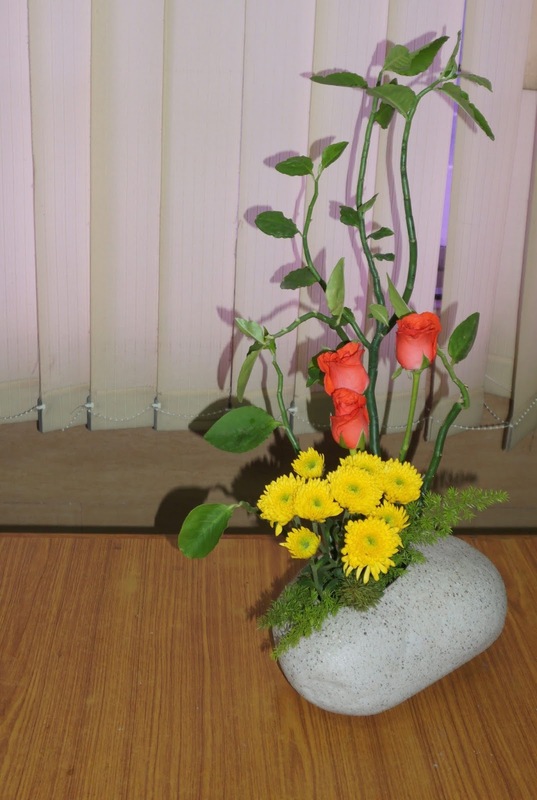 We were all delighted to meet our outstation member Venkatesh, for whom time seems to stand still!. 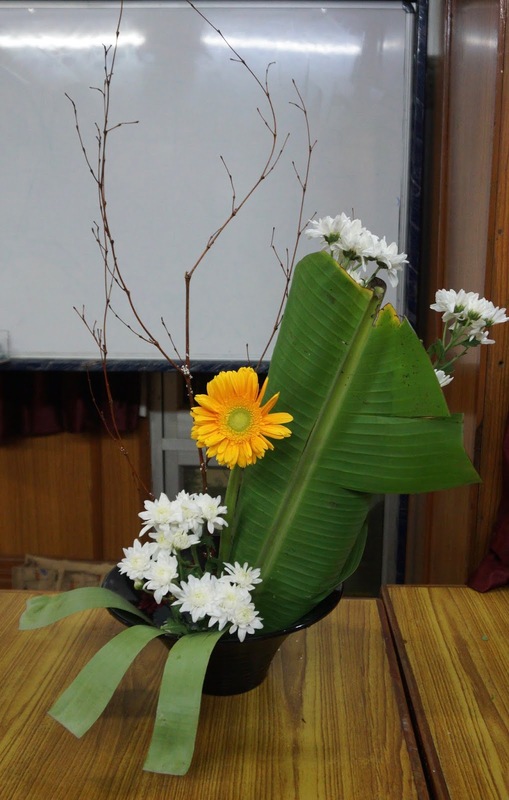 We hope he will be able to make it for a few more of our workshops, and also participate!